USTA Southwest held its first-ever Tri-Level Section Championships, Jan. 23-25 at the Surprise Tennis & Racquet Complex welcoming	more than 100	players to the inaugural event, which paired players of different National Tennis Rating Program (NTRP) levels together on teams.Central Arizona claimed the men's division, besting second place Northern Arizona by a 14 total games (163 to 149). The winning CAZ men's team was captained by Dane McNeill, and included	Garth Guibar, German <?xml:namespace prefix = st1 ns = "urn:schemas-microsoft-com:office:smarttags" />Moreno, James Munoz, Joe Johnson, Omar Garcia, Rick Bonafasi, Scott Goodman, Thien Ngo, Vernon Rhone, Matthew Rhone and Jonathan Levy. 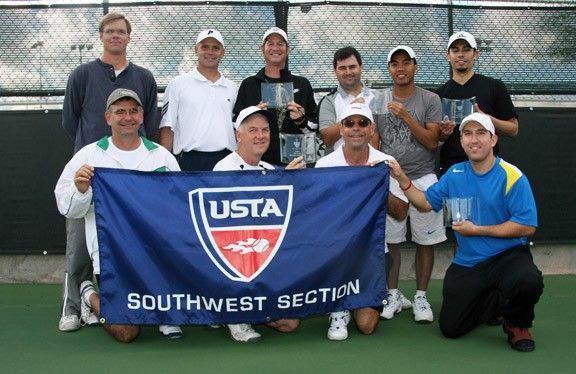 Winning teams	will now advance on to the USTA National Tri-Level	Championships, held March 20-22,	during the Pacific Life Open. Congratulations to the winning Central Arizona men's team!